Part of the investigation involved reviewing footage and photographs of Buk missile launchers sighted in both Ukraine and Russia looking for any other Buk missile launchers that may have had similar markings. During this research we were unable to find markings that matched the Buk seen in both Ukraine and Russia that was linked to the downing of MH17. It also showed that the inconsistent nature of markings on Russian Buks would suggest that the markings were likely to be unique to that Buk. 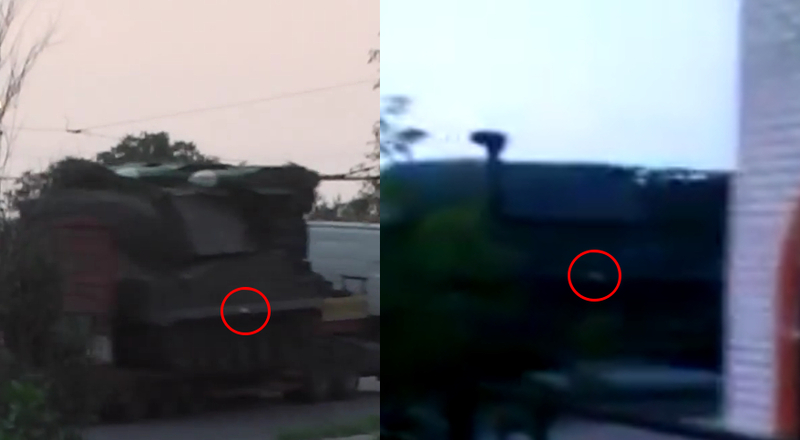 On the left: an image from a video widely spread in the wake of the MH17 tragedy. [Source]. On the right: another unpublicised video from around Staryy Oskol uploaded on the 23rd of June. [Source]. However, in the interest of thoroughness and openness, we are now creating a crowdsourced investigation of Russian and Ukrainian Buks using Meedan’s Checkdesk. Bellingcat readers are invited to help find images of Buks in Ukraine and Russia so we can have the best idea of what markings are visible on Buk missiles launchers used by both countries, and find other potential matches to the Buk linked to the downing of MH17. We invite Bellingcat readers to contribute to the investigation by visiting Bellingcat’s Checkdesk, and contributing links to images of Buk missile launchers in Ukraine and Russia, or to comment below. This is a great opportunity to use crowdsourced investigation to verify claims made by Bellingcat that the Buk missile launcher that was used to down MH17 came from Russia, so we hope you all join us on this investigation. Great investigation, let’s carry on. Interesting to mention, the Ukranian Director of Informational Security was absolutely sure that the missile was launched by a Russian officer a couple of days after the downing of the plane, but no proof has been layed out since. It is to me quite strange, that there seem to be a lot of sightings of buk all over the place, but there is no picture of the trail of a launched missile. As a result, it is not serious to talk about “mh17 linked buk”. In particular as the official investigation does not (yet) say that a buk caused the catastrophe. 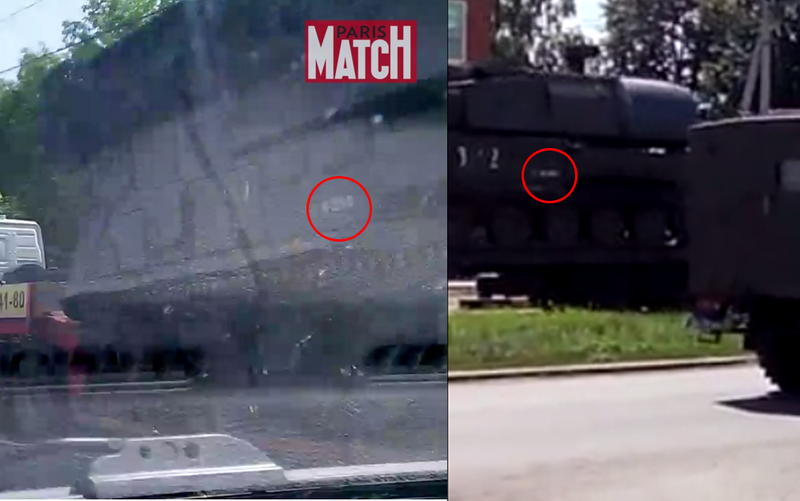 I have been looking at a number of the photos of the “BUK” linked to the shooting down of MH17 over some time now. Some I have mentioned to you on twitter. some other helpful things that I have been able to find on these photo’s Are as follows. From the video of the “BUK’S” in the convoy the 2nd BUK which is marked 3*2, which can also be made out on other photo’s as been the unit used, photos both inside Ukraine and also been transported out back to Russia. Many are saying that these painted on numbers could have been done at any time to point the finger at the RF. However Having examined these photos and video’s more closely I decided to try and find other identifying marks and also any damage on the “BUK” units that can clearly nail this once and for all. The “BUK” in the video 3*2 if you look at the side on the track side skirt you will note damage running along this, mostly in the form of miss shaping due to knocks ect. as you go along a number is on it above the 3rd/4th road wheels, “of the side skirt” this number which lines up on the main Hull around half way as far more damage along it and almost looks to be bent down slightly. 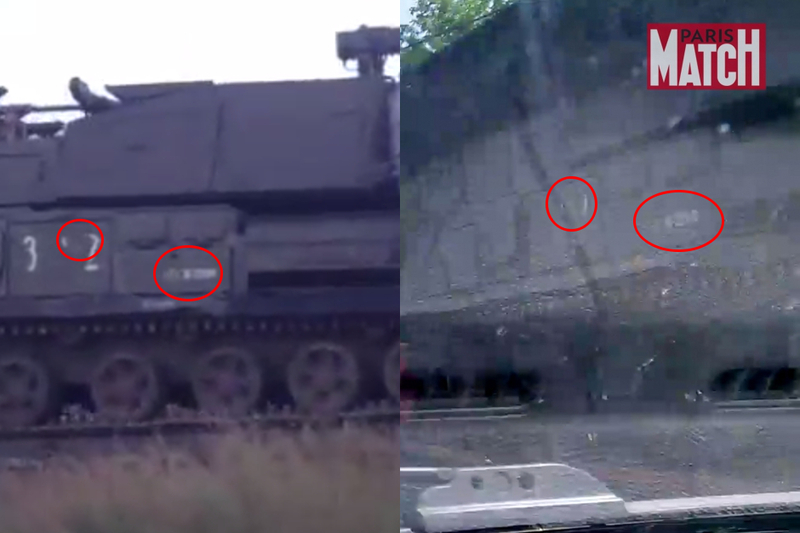 This wave in the skirt and bent end section can be clearly made out in the convoy video, as well as in some of the photos showing the “BUK” been transported out of the Ukraine. Unlike the claims saying the painted numbers could have been changed, it would be impossible to create this same kind of damage to the track side skirt. I have spent some time trying to match this evidence from available photos and videos available. I have used both photos and video stills to do this, and the match of the damage on this one “BUK” unit Number 3*2 the pattern of the wave as well as the bend/damage are identical on ALL available sources. As stated this would NOT be possible to recreate. and as in work that I posted on twitter Aug 17th this now adds to the markings I had found previously. I would be grateful if you would take a look at this and get back to me with your thoughts on this further evidence.